Direct jobber Ted Pickul drives a 1992 Geo Prizm with unusually high miles. As of February 2005 the Prizm had over 362,000 miles on only 15 oil changes and 31 filter changes. Pickul credits AMSOIL products with extending the life of his cars engine. 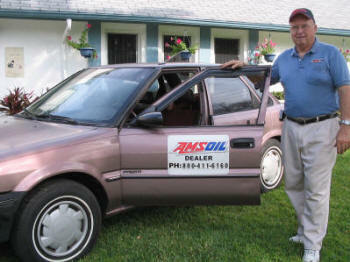 Pickul bought the Prizm new in June of 1992 and after 3000 miles, converted it to AMSOIL 10W-30 Synthetic motor oil. Pickul also installed an AMSOIL 2-Stage Air filter. Pickul converted to AMSOIL Automatic Transmission Fluid at 30,000 miles, and has changed it five times. After owning the vehicle for one year, Pickul changed the engine coolant to AMSOIL Antifreeze Engine Coolant which he changes at two-year intervals. Pickul uses a 16 oz. bottle of PI Gasoline Additive every three or four months, and every 30,000 miles he treats the car to AMSOIL Power Foam Carburetor and Engine Cleaner. At 200,000 miles Pickul converted to AMSOIL 10w-40. Pickul has demonstrated complete faith in AMSOIL products to keep his car running smoothly. "In November 2000 with 239,000 miles on the engine, I drove the car from Sarasota, Fla., to Carbondale, Ill., without stopping," said Pickul. "The 13-hour trip was a true tribute to the AMSOILization of this vehicle." The Prizm has a 1.6 liter engine that has had no major problems. 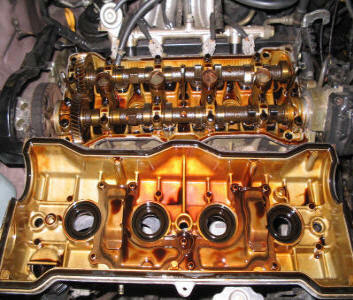 The valve cover was removed at 360,000 miles and it was exceptionally clean.